Team Virginia had yet another great trip up to the NYC Armory. In total Virginia has two national records, five national champions, and four state records. Virginia also had six Emerging Elite or Jr high school winners and an additional 24 All-American finishes. 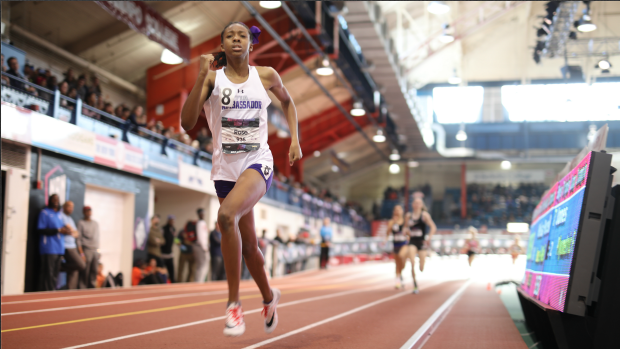 In Friday's competition it was Jalani Davis (Bethel) taking home the first title of the entire championships. She won the Girls' EE shot put. She was later joined by Caleb Coles (Amherst - High Jump), the Highland Springs Boys (4x2 & 4x4), and the Western Branch Girls (4x2) as emerging elite champions. 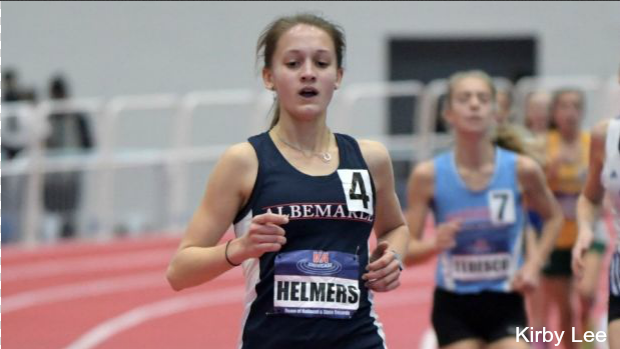 Ryann Helmers (Albemarle) was Virginia's sole individual running All-American on Friday with her 3rd place finish in the girls' 5K. Taylor Beard of John Handley was able to shine on the field Friday with her 4th place finish in the high jump. Finally closing out the day was the quartet from Loudoun Valley. Their guys' team ended up third in the distance medley relay. Here we will start with the field events. Seniors Alexis Clark (James Monroe) and Trey Causey (John Handley) both impressed a lot of people. Clark finished 5th in the shot and Causey finished as the national runner(Jumper? )-up in the high jump. In just five other events Virginia racked up an additional 14 All-American finishes. The biggest of these coming in the shuttle hurdle relay. In the boys' shuttle hurdle relay it was the Tigers of Oscar Smith taking home the national title with a complete underclassmen squad. They were followed by Western Branch in 4th. Over in the girls' competition Western Branch finished second and third with Tallwood fourth. 5 Star Track Club of VA was fifth. That was the shortest relay of the weekend but in the longest one Virginia did just as well. More specifically Loudoun Valley did just as well by taking home the win and national record in the 4xMile. Their "B" team finished 6th overall as well. Then in the SMR it was Western Branch's girls taking home the win and Broadway's boys finishing 6th. Next up was the 4x800m relay. Loudoun Valley won the guys' competition with a US #2 All-Time performance and Western Branch finished 5th. The West Springfield girls finished 6th in their race. The last event of the day was also one of the most exciting of the weekend. 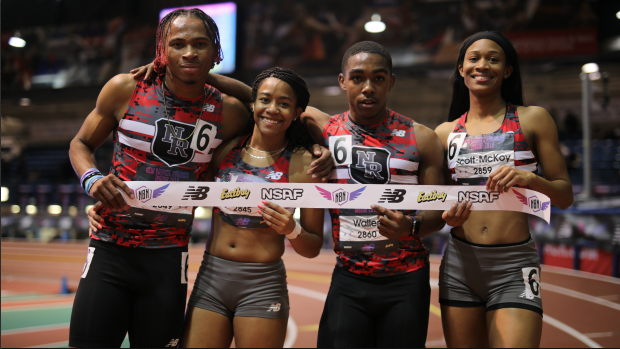 In this mixed 4x400 we saw Nansemond River come from behind the final 200 to take home the win, national title, and national record for this new event. Sometimes you need young leaders to show you the way, that was what Tanner Baker (Gloucester) did by opening the day strong for VA with his win in the junior high school Mile. He was then followed by another youngster, Michaela Rose who finished 6th in the 800 after having to chase the clock in the first section. Britton Wilson (Mills Godwin) and Hannah Waller (South Lakes) were the only other two athletes from VA to finish with such honors in an individual event on Sunday. Wilson finished 6th in the 400 and Waller finished 5th in the 200. Team VA once again showed out in the relays though with Nansemond River, Western Branch, and C.D. Hylton finishing 2-3-6 in the Girls 4x200. That was a race that saw the U20 World record fall by Bullis (MD) and more importantly the VA State Record by Nansemond River. Nansemond River may not have won their third girls' title in a row but they did break the state record for the third year in a row and got to see their guys' team win the boys' race for the national title. That made it three years in a row that their school has won the event and four years in a row that a guys team from VA has won the 4x2 national title. Fork Union, the VISAA State Champions, finished 6th in this race with a VA top 10 All-time performance. Closing out the meet was the 4x400m relay. The Western Branch girls finished 3rd with their guys' team finishing 4th in state record fashion. Colonial Forge was sixth in the guys' race.